From the cover of “New Adventures of Superboy” #27, March 1982. Art by Kurt Schaffenberger. John F. Kennedy was president of the United States from his inauguration on January 20, 1961, through his assassination 50 years ago today on November 22, 1963. During his short time as president, JFK was quite popular, and even 50 years after his death, he’s still a frequently referenced figure in popular culture. Thus, I thought I’d look at a few of Kennedy’s appearances/references in cartoons. Interestingly, animated cartoons of the early 60s (theatrical or television) didn’t seem to make any references to Kennedy that I could find. 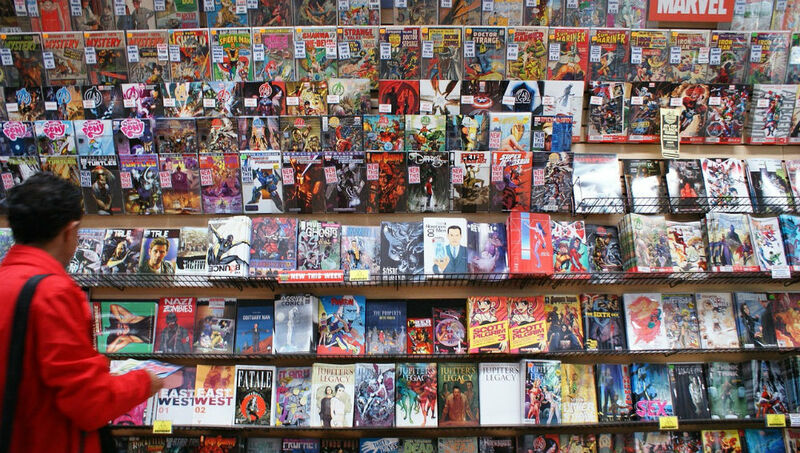 Thus, the examples below are mostly era-specific comics or animated references from years later. President Kennedy made a fair number of appearances for a sitting president in the pages of Superman comics during the early 60s. However, his most famous appearance was in the story “Superman’s Mission For President Kennedy.” The story was being worked on just as the president was assassinated. With later permission from the Johnson administration and the Kennedy family, DC finally published the story in “Superman” #170 (July 1964). The story focuses on Superman working with President Kennedy to improve the nation’s physical fitness among youth. “Dial B For Blog” has a summary of the story’s history, including some panels; meanwhile, this blog sums up the various appearances of JFK in Silver Age stories. Recently, the artwork for this story’s hit the news, as it turned up at an auction—despite supposedly having been donated to Kennedy’s presidential museum. The story’s artist, Al Plastino (who drew various late Golden Age and Silver Age Superman stories), wasn’t pleased at this news. The auctioneer says the seller bought the artwork at a Sotheby’s auction back in 1993. Of course, these days a 29-year-old Superman would be deemed a Millennial. At this point, he wouldn’t have even been born yet when Kennedy was president. 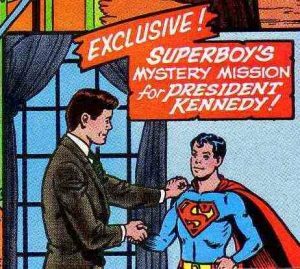 If he were still canonical, the earliest president Superboy could’ve met at the time of this writing is Bill Clinton. The Mayor of Springfield, “Diamond” Joe Quimby, is a parody of Kennedy. Quimby resembles Kennedy down to his speaking voice and lesser qualities (various affairs, etc.). Similar to the Kennedy family, Quimby’s family seems influential in Springfield. The newspaper comic strip “Doonesbury” ran a storyline during the early 1990s about conspiracy theories (of which there’s a metric ton) about the Kennedy assassination. Uncle Duke mentions running a few scams in the 60s related to such. He’s delighted that he can recycle them for a new batch of “Tiny Toons” (as he described the conspiracy theorists) who believe such theories. Kennedy was portrayed in an episode of “Histeria” set during the early 60s. There, he attempts to deliver a speech to the United Nations. Unfortunately, the Histeria cast’s antics lead to disastrous results. Marvel Comics didn’t seem to refer to President Kennedy as often during his term in office. The alternate-universe set Ultimate line of comics had its own version of JFK’s assassination. Of course, it was portrayed in the line’s usual style, or rather lack thereof. Minorities in cartoons: "Class of the Titans"